This year Pepsi decided not to advertise during the Superbowl, and put efforts into community based campaigns instead. 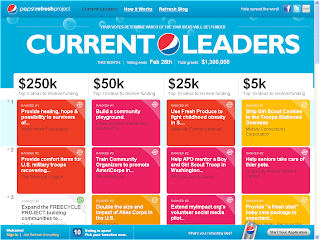 The main fruits of this is RefreshEverything, a kind of crowdsourced charity campaign. People can nominate projects for funds, site visitors vote for their favourites. As such nothing too controversial is likely to get selected - current leaders include a project to provide healing for victims of abuse, use fresh produce to fight childhood obesity, and ship girl scout cookies to troops stationed overseas. Different bands of funding exist. They give away $1,300,000 a month, which isn't to be sneezed at - you can see the development of these projects bringing extra kudos to Pepsi as time goes on too. Sharing buttons make it easy to spread the word, and this is a very good 'big idea' and use of media.